Contemporary jewellery designer Wendy Ramshaw’s earlier work, including her signature ring stacks first made in 1967, is coming back onto the market. In contemporary jewellery circles, the Sunderland-born designer Wendy Ramshaw (b.1939) would need little by way of introduction. But, as a relatively new name to watch in the secondary marketplace, she might. A child of the Festival of Britain whose first escapade in commercial jewellery design was the Something Special self-assembly paper jewellery sold through Mary Quant’s Bazaar and other fashionable London outlets in the Swinging Sixties, it was not until the following decade that her career took off. 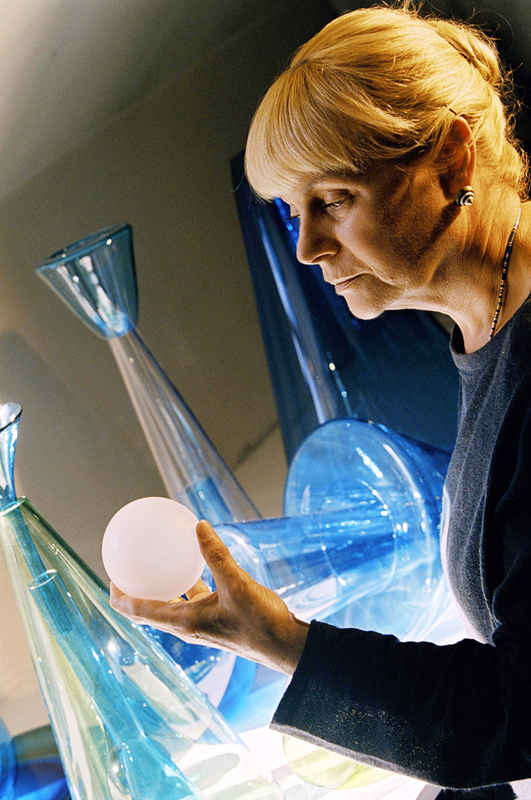 Wendy Ramshaw in her studio, 2007. Photo: Phil Sayer. The breakthrough year was 1970 when Ramshaw’s work was first acquired for the Goldsmiths’ collection, followed in ’72 by a Council of Industrial Design award for innovation. The subject of particular praise was the ring stack – the skilfully made sets of gem-set gold and silver rings displayed on sculptural stands that (first made in 1967) fast became her signature pieces. Forty-five years ago it was radical. Today, they are in more than 80 public collections around the world. Many formed part of the 2012 Room of Dreams career retrospective at Somerset House. They are still being made in the modest Clerkenwell studio where Ramshaw has based herself for the past 30 years. Although quite prolific, Ramshaw’s work has only just begun to appear at auction or in dealerships – and for good reason. Those who have bought her jewellery have tended to hang on to it, and doubtless it is more accessible to many daughters and granddaughters than a Victorian crescent brooch or a Belle Epoque sautoir. But jewellery acquired 30 or 40 years ago is coming back onto the market. The four ring stacks offered by Mallams (20% buyer’s premium) in Oxford on December 7 came for sale from an Oxfordshire estate. Jewellery by Wendy Ramshaw sold at Mallams Oxford in December. 2: A set of six silver and agate Ramshaw stacking rings, 1989, £550. 3. A set of four silver stacking rings of geometric design, 1993, £620. 4. A set of four 9ct gold and green agate cabochon stacking rings, 1971 (plus three further unsigned rings), £1200. 5. 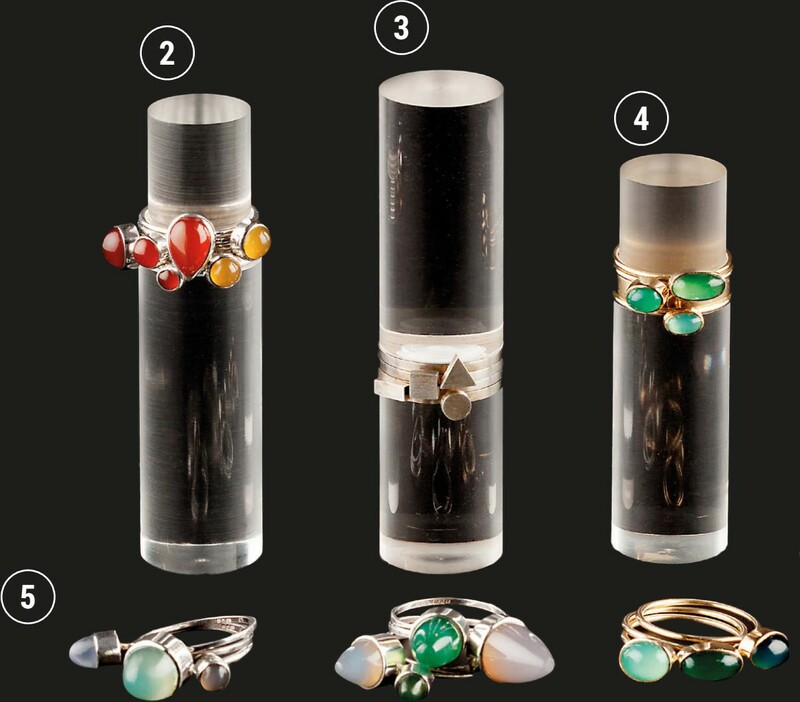 A set of seven silver and agate stacking rings, 1988-89, £650. Ranging in date from 1971-93, they were trademark works: Ramshaw embraced colour and semi-precious stones but, unlike other artist-jewellers of the time, she favoured neat cabochon shapes over uncut gemstones. Sold with original perspex stands, they proved very popular both at the viewing and during the sale. All bettered estimate, selling for sums between £550 for a set of six silver and agate rings hallmarked for London 1989 to £1200 for a stack of seven 9ct gold and green agate rings (three unsigned) made in 1971. 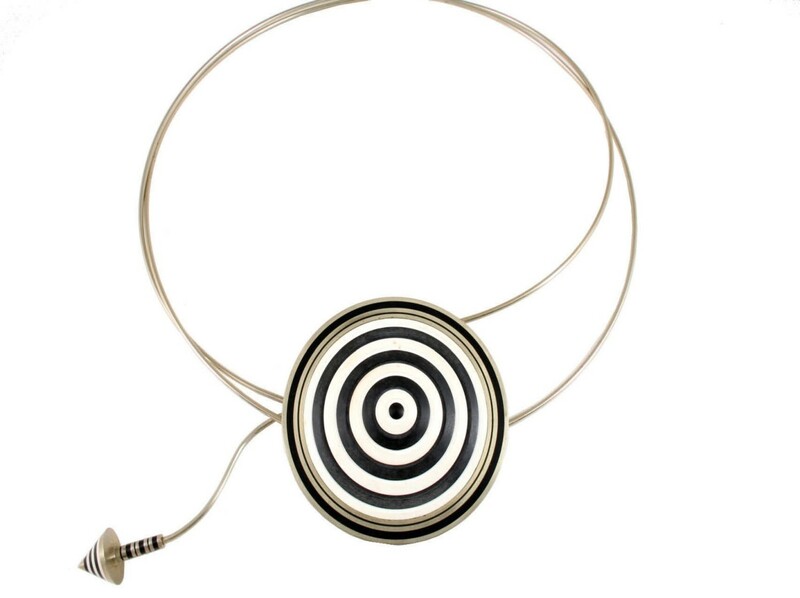 Another of Ramshaw’s most recognised designs is the Orbits series of nickel alloy and black/white resin necklaces. A handful of Orbits necklaces have been sold before. One formed part of the remarkable Alan and Pat Firth collection sold by Macclesfield saleroom Adam Partridge in October 2015. Purchased by the Firths from the Crafts Council shop at the V&A in 1990, it sold at £3000. 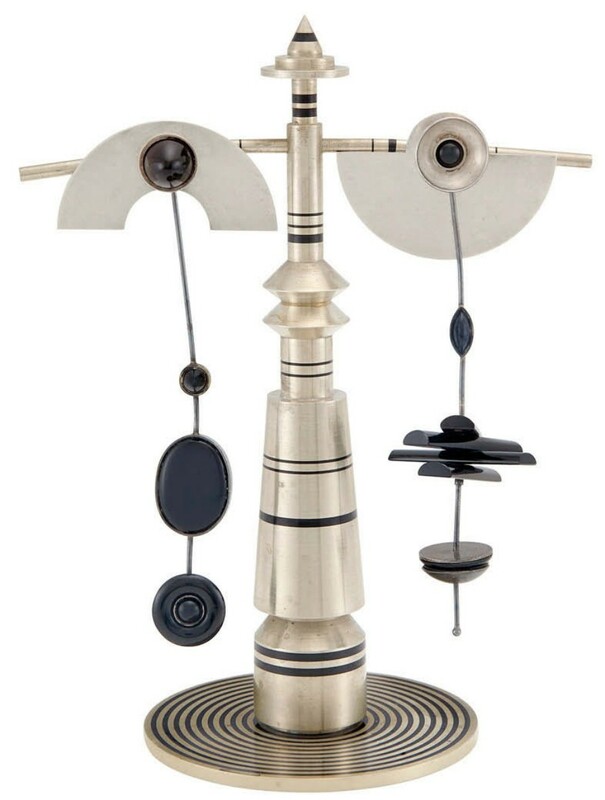 Two others took $2250 (£1500) each at Doyle New York in November 2016: a sale where Ramshaw’s nickel, silver, enamel and resin pendant earrings and tower c.1988 took $2000 (£1350). Much more recently, one was included in the Lawrences (22% buyer’s premium) of Crewkerne sale on January 18 where it sold at £1500. It was one of two pieces of Ramshaw jewellery entered for sale by a friend of the designer who had received them as gifts and the first specialist Miranda Bingham had offered for sale. There was particular interest from both the trade and private collectors – “although perhaps not the usual ones,” Bingham noted – in a gold and circular cabochon opal necklace made much earlier in Ramshaw’s career. 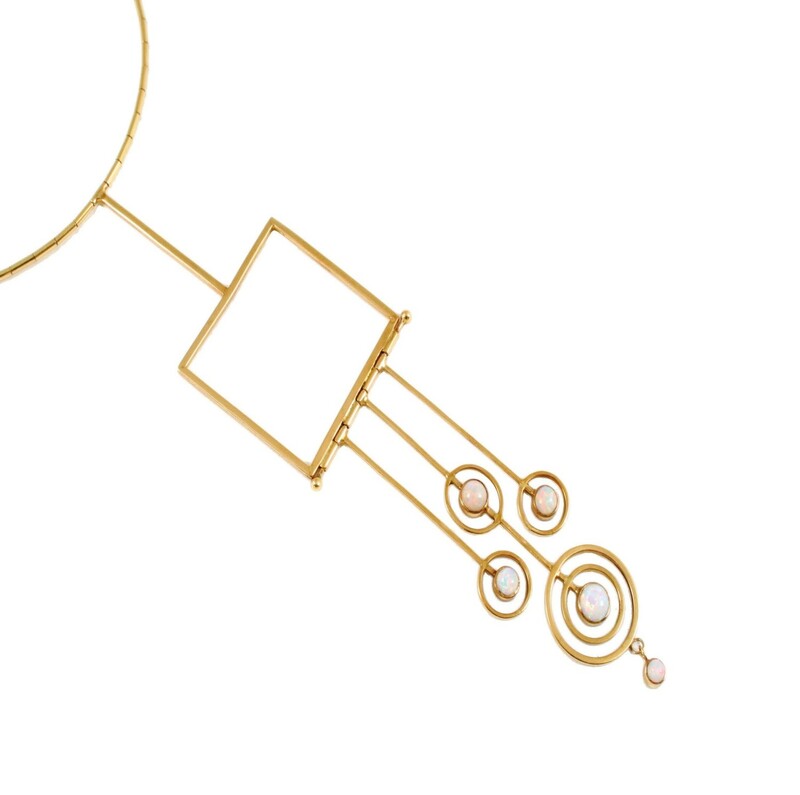 Combining an openwork geometric design with one of the designer’s favourite stones, it was hallmarked for 1971. It was bought by a jewellery dealer who collects Ramshaw at £4600 (estimate £1500-2000).